When I was younger, I was a huge scifi fan: books, movies, comics, TV shows, I loved it all. I still do, though I don’t read much of the genre these days. As a writer, I think it’s important to read many different genres in order to improve my own craft. So, today I took a look at Amazon’s science fiction freebies. Space opera is a subgenre of science fiction that emphasizes romantic, often melodramatic adventure, set mainly or entirely in outer space, usually involving conflict between opponents possessing advanced technologies and abilities. It has been a popular subgenre, not just in literature but also in television and movies. “Star Trek” and “Star Wars” are considered space operas. I would say its popularity has waned in recent years, displaced by super heroes and dystopia. However, the upcoming Star Trek movie, “Into Darkness,” could rekindle interest in the genre. At its best, a space opera is a cracking good yarn, that is, a story that loses you in its world and keeps your interest from beginning to end. The books listed below look to be such yarns. Enjoy! All books listed below are by David Drake. The inhuman Rulers of the galaxy sent three fleets to learn what had happened to the world located by Captain North and the Survey Team he led. Neither a soul nor a message returned. The fourth time, the Rulers sent a single man: Nils Hansen. Commissioner Hansen had a mind that saw the shortest path to each task’s completion and a ruthless determination to do what the task required. The cost – to himself and whoever happened to be in the way – didn’t matter. Hanson’s Special Units had kept his planet safe from the most sophisticated and violent criminals in the galaxy. Now Hansen was being sent to penetrate a spacetime enigma which had made gods or demons of the first humans to discover it. He would succeed or die. They were the toughest fighters in the galaxy – until they got used up. The mission: redemption-or death. The troops were walking dead already, so there wasn’t much of a downside. Major Arthur Farrell and the troops of Strike Force Company C41 had seen too much war with the alien Kalendru. They had too many screaming memories to be fit for combat again, but they were far too dangerous to themselves and others to be returned to civilian life. Earth is a dead cinder beyond the dense clouds. On a terraformed Venus the land is ruled by savage plants and the even more savage beasts that prey on them, while monsters out of nightmare swim though the globe-girdling seas. Mankind huddles in domed underwater Keeps, living a purposeless static existence—dedicated to pleasure but destined for oblivion later if not sooner. Only the Free Companions, the mercenaries who fight proxy wars for the Keeps, live on the surface of Venus. Their warships course the seas, battling one another in struggles to decide victory or defeat for one day, life or death for a few individuals. The Free companions live till they die with the searing thrill of danger, and their deeds bring excitement and color to the bored residents of the Keeps; but Mankind is doomed unless something changes. FROM PALACE . . . Dennis flees the crystal walls of Emath when he learns the truth behind the city his father rules. TO WILDERNESS . . . The jungle enfolds him, tests his sword arm with monsters and his courage with nightmares more terrible than any monster. FROM LOVE . . . Sword and spirit can win Dennis a princess– TO BLACKEST WIZARDRY . . . But he can overcome the final evil only at the risk of all he has become–and his soul besides. 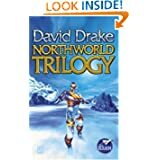 This entry was posted in Free eBooks, Genre, Kindle Bargains and Freebies and tagged Books, David Drake, Fiction, Free, genre, Kindle, Science Fiction, Space Opera, Writing by Lori Saltis. Bookmark the permalink. Big fan of space operas. They are my favourite to read and my favourite to write. Thanks for posting.